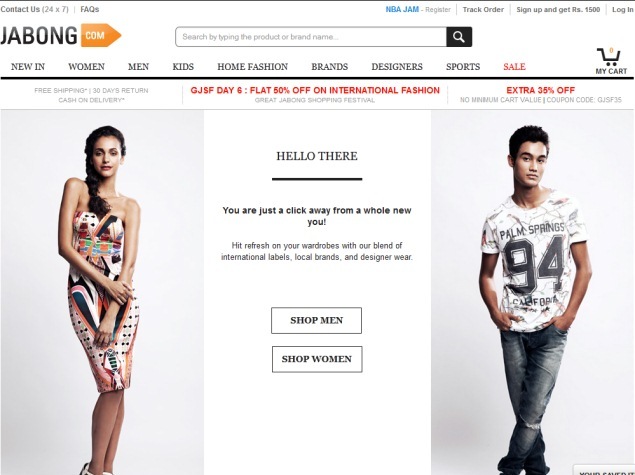 Online fashion retailer Jabong.com, which has been looking for a buyer for some time now, may not get its asking price of $250 million to $300 million, according to media reports. However, the sale process is likely to be completed in the next six months, the reports added. Mint newspaper, citing sources, said on Monday that Snapdeal, Flipkart and Aditya Birla Group are among some of the suitors for Jabong, owned by Global Fashion Group (GFG). "Snapdeal and Aditya Birla are front-runners for Jabong... Flipkart is believed to be interested in the deal since it owns leading online fashion retailer Myntra, which competes with Jabong," the newspaper said, citing sources. Jabong co-founder Praveen Sinha had last year admitted that the company was not making money, even though sales had doubled to $600 million in 2014 from $300 million in 2013. Jabong was aiming to grow in a balanced way by paring down losses, he had told NDTV Profit. Launched in 2012, Jabong gave tough competition to Myntra, before scaling down discounts to focus on bottom line. It cut down its losses to Rs 46.7 crore in 2015 from Rs 159.5 crore in 2014. Jabong's story reflects the ongoing consolidation in the domestic e-commerce industry, where the focus has shifted from raking up higher gross merchandise value (GMV) to profitability. "Companies are focusing on turning unit economics positive (if not already done so), as opposed to primary focus on GMV (Gross Merchandise Value) earlier. We believe this may be a function of limited availability of capital, leading companies to focus on cash generation," said Kawaljeet Saluja of Kotak in a report published last month. Earlier this year, the government notified new rules, prohibiting marketplaces from offering discounts and capping total sales originating from a group company or one vendor at 25 per cent. "Post government regulations that curtailed discounts, companies seem to have done away with the same; most discounts being seen online are being offered by sellers/brands themselves. Most companies we spoke to are also evaluating other revenue streams such as advertising and online content to better leverage their platform," Mr Saluja added.